Place NEIPlugins jar into your mods/ directory. 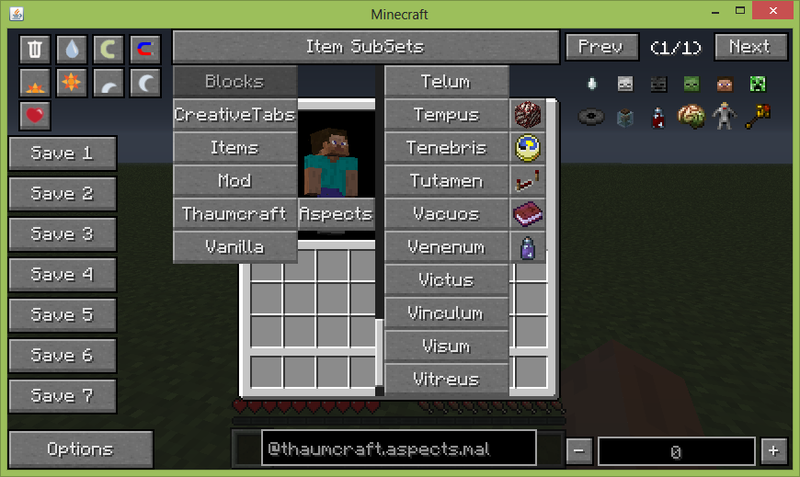 Press "L" (you can change this key in NEI Control options) in player inventory to see new NEIPlugins menu. Show Rolling Machine, Rock Crusher, Coke Oven and Blast Furnace recipes. Also can show Steam Boiler info. Show Smeltery and Liquid Casting recipes. Show discovered Crucible, Infusion Altar and Acrane Worktable recipes. In order to add subsets for aspects you must set option "mistaqur.addThaumcraftAspectsSubsets=true" in file "config/NEI.cfg". Show Sludge Boiler recipes. Also can display list of ores for Laser Drill in "Info lists". Force Engine: fuels and throttles. Diesel Generator, Gas Turbine, Thermal Generator, Semi Fluid Generator, Plasma Generator, Magic Energy Converter.